Detects Furin from canine and mouse cells as well as transfected human Furin. This antibody does not detect endogenous Furin from BSC-40, HeLa, J774A.1 BPAEC, or CHO cells nor from rat skeletal muscle, spleen, kidney, ovary, testes, heart, or brain tissue. Synthetic peptide corresponding to Human Furin aa 780-793. Furin is a membrane-associated, calcium-dependent, serine protease that belongs to the subtilisin-like prohormone convertase (PC) family. Members of this family of cellular enzymes cleave most prohormones and neuropeptide precursors. Numerous other cellular proteins, some viral proteins, and bacterial toxins that are transported by the constitutive secretory pathway are also targeted for maturation by PCs. Furin and other PC family members share structural similarities which include a heterogeneous ~10 kDa amino-terminal proregion, a highly conserved ~55 kDa subtilisin-like catalytic domain, and carboxyl-terminal domain that is heterogeneous in length and sequence. These enzymes become catalytically active following proregion cleavage within the appropriate cellular compartment. Furin is the only known PC to possess a transmembrane domain. Cleavage of target proteins occurs at the carboxyl-terminus of the furin consensus sequence, RX(K/R)R. It has been shown that the acidic peptide sequence, C771PSDSEEDEG780, localizes furin to the trans-Golgi-network. Phosphorylation of serine residues within this region modulates intracellular routing of Furin protein. An additional signaling domain includes the tetrapeptide sequence, Y759KGL762, which directs internalization from the cell surface. Our Abpromise guarantee covers the use of ab3467 in the following tested applications. WB Use at an assay dependent concentration. Detects a band of approximately 100 kDa (predicted molecular weight: 87 kDa).Can be blocked with Furin peptide (ab4989). Representing Furin in BSC-40 cells transfected with the human Furin gene. Furin is likely to represent the ubiquitous endoprotease activity within constitutive secretory pathways and capable of cleavage at the RX(K/R)R consensus motif. Seems to be expressed ubiquitously. Belongs to the peptidase S8 family. Furin subfamily. Contains 1 homo B/P domain. Contains a cytoplasmic domain responsible for its TGN localization and recycling from the cell surface. The inhibition peptide, which plays the role of an intramolecular chaperone, is autocatalytically removed in the endoplasmic reticulum (ER) and remains non-covalently bound to furin as a potent autoinhibitor. Following transport to the trans Golgi, a second cleavage within the inhibition propeptide results in propeptide dissociation and furin activation. Phosphorylation is required for TGN localization of the endoprotease. In vivo, exists as di-, mono- and non-phosphorylated forms. Golgi apparatus > trans-Golgi network membrane. Cell membrane. Shuttles between the trans-Golgi network and the cell surface. Propeptide cleavage is a prerequisite for exit of furin molecules out of the endoplasmic reticulum (ER). A second cleavage within the propeptide occurs in the trans Golgi network (TGN), followed by the release of the propeptide and the activation of furin. Immunolocalization of endogenous furin in mouse 3T3 cells with ab3467. The band observed at 63 kDa could potentially be a cleaved form of Furin due to the presence of a 24 amino acid signal peptide and a 83 amino acid propeptide. 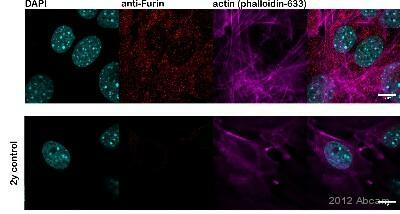 Immunocytochemistry/ Immunofluorescence - Anti-Furin antibody (ab3467)Image courtesy of an anonymous Abreview. 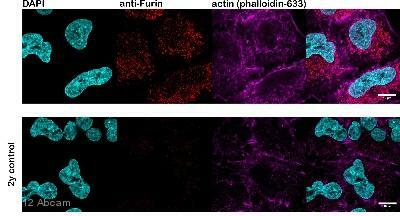 ab3467 staining Furin in human A549 cells by Immunocytochemistry/ Immunofluorescence. Cells were fixed with paraformaldehyde, permeabilized using 0.1% Triton X-100, blocked with 1% BSA/ 5%FBS/PBS for 1 hour at 25°C and then incubated with ab3467 at a 1/100 dilution for 1 hour at 25°C. The secondary used was an Alexa-Fluor 546 conjugated goat anti-rabbit polyclonal used at a 1/500 dilution. Cells were counterstained with DAPI (436nM, 5 mins) and Phalloidin-633 (1unit/coverslip) and mounted with prolong gold. No staining seen in secondary control and furin staining was punctate and throughout the cytoplasm. Publishing research using ab3467? Please let us know so that we can cite the reference in this datasheet. So, you are saying, the 60kD band is the Signal Sequence (˜24AA)+ Propeptide (˜130AA) + catalytic domain (˜280)+ partial RGD domain. We believe that the antibody recognizes the mature form of the protein. The pro-peptide is expected at 87kDa and once the signal and pro-peptide are cleaved off the protein, it migrates at 63 kDa. I hope this is helpful and wish you a good weekend. BATCH NUMBER -- NOT SPECIFIED -- ORDER NUMBER 111548 DESCRIPTION OF THE PROBLEM Antibody recognises multiple bands - major ones at 250, 100, 75 (triplet) and also picks up 37 kDa MW marker! Peptide (ab4989) takes out 250, upper band of 75 kDa triplet and MW marker (!). SAMPLE Human cultured cardiac fibroblasts - whole cell homogenate PRIMARY ANTIBODY Abcam furin convertase (ab3467) 1:500 - 1:1000 DETECTION METHOD Pierce ECL POSITIVE AND NEGATIVE CONTROLS USED HT-1080 cell homogenate ANTIBODY STORAGE CONDITIONS -20C aliquoted SAMPLE PREPARATION Laemmli sample buffer + PMSF + Na vanadate. Boiled + 2-mercaptoethanol for 5 min. AMOUNT OF PROTEIN LOADED 50-100 ug per lane ELECTROPHORESIS/GEL CONDITIONS 10% gel. reducing. TRANSFER AND BLOCKING CONDITIONS Blocked in 5% Milk in TBS Tween SECONDARY ANTIBODY [a competitor] rabbit-HRP 1:2000 HOW MANY TIMES HAVE YOU TRIED THE APPLICATION? 5 HAVE YOU RUN A "NO PRIMARY" CONTROL? No DO YOU OBTAIN THE SAME RESULTS EVERY TIME? Yes WHAT STEPS HAVE YOU ALTERED? Antibody dilution, addition of neutralising peptide ADDITIONAL NOTES Attached is a figure of blot with and without peptide. Thank you for your enquiry. I am sorry to hear that you have been having difficulties with this antibody. We have received a favourable review of our Furin Convertase antibody (ab3467) albeit with acknowledgement of the detection of some non-specific bands. We often receive complaints relating to aberrant bands that can often be resolved with the use of 5% BSA as a blocking agent. We find it gives a cleaner more specific blot. I would therefore like to recommend its use on this occasion. I would also recommend performing an overnight incubation of the antibody, at a more dilute concentration e.g. 1:1500 at 4oC as again we often find that this increases the specificity of the blot. I hope this information helps, please do not hesitate to contact us if you need any more advice or information.